This set was exactly what I was looking for to compliment the rest of my decor in my formal living room. The color of the vases on the picture look more silver but in person the vases have a more of a golden tone than silver. 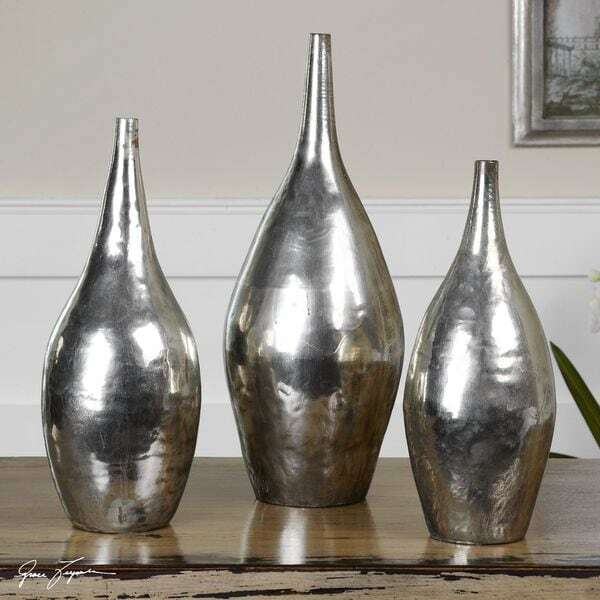 These vases are made of shiny, silver electroplated metal. The set of three is the perfect accent for any home or office. The vases in the picture look beautiful. It is a silver/metallic finish and glossy, a slightly imperfect with dents and discoloration. The vases I received are TOTALLY different. It looks more bronze than silver. I am returning immediately. Nice vases, but they are not silver by no stretch of the imagination. they are brown. They would not match my silver plans in the kitchen, so I put them in my master bathroom which has a brown, gold and bronze color scheme. The vases are perfect there over my soaking tub. This item came very quickly, but the color looks a lot more gold in person than silver. If you’re into mixing metals, or have more so of a gold theme, then these vases are for you. These were just what they looked like in the ad. We are pleased. The color is not as pictured. "Is the 16 in the taller vase? What is the height of the other two?" Hello Charmelie, the tallest vase is approximately 16" inches. The medium is approximately 13" inches and the smallest is approximately 12" inches. Please let us know if you have additional questions. Thanks for shopping with us.